This articles applies to BarTender 2016 and below. If you are looking to find your license host in version 2019, please see How to find your License Host on your network in BarTender 2019. Seagull License Server (SLS) is used for tracking printer licenses. There are times you may want to view its contents or upgrade your printer license count. 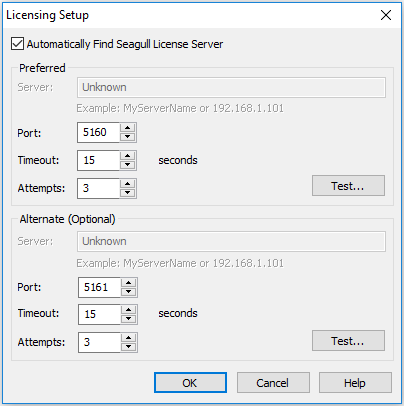 If you are unsure where your Seagull License Server currently resides on your network, you may be able to locate it by using an installation of BarTender that can already connect to SLS and print. Your IT/Network administrators may also be helpful when attempting to locate Seagull License Server on your network. For more information regarding Seagull License Server and how it works please view: What is Seagull License Server? Complete the steps below to successfully locate and open Seagull License Server. Open an installation of BarTender that is currently able to contact SLS. Close the Welcome dialog if it opens. You will now be looking at a blank BarTender window, with no documents open. From the BarTender Administer menu, select Licensing Setup to open the corresponding dialog. In the Preferred section in the top half of of the dialog, click the Test button This will return the hosting location of Seagull License Server. In this example, SLS is hosted on a server named "ServerName". To view Seagull License Server, physically go to this server or PC, or use a remote desktop tool to access this machine. Tip: In the steps below, make sure to select Seagull License Server, not Seagull License Server Remote Administrator. You should now have opened Seagull License Server on the host machine.